The fire season has started this year. Winter played out early with nothing but dry dust and wind running across the tops of the blue pines, the edge of insipid storms arching north eastward without rain. The dead tree is down and cut up waiting to be split and hauled to the house for next winter. 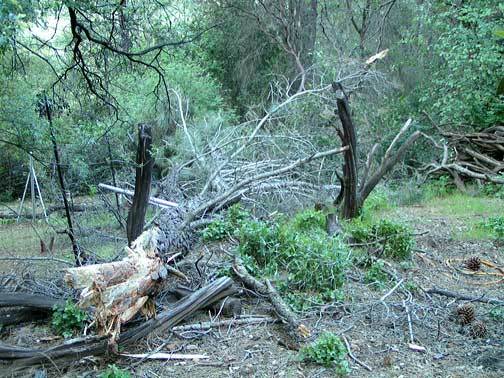 But another blue pine broke off about halfway up and crashed down on the back end of the outer goat pen. I do not know what to do with it. It is too late in the season to burn the snags and too far away from the drive to cut it up for the chipping crew I will probably buck it up a bit and wait out the summer. It is moments like this when I have to step back and remember what the forest is all about. It is an ocean twisting and thrusting toward the factory of the sun. Fierce competition rages in those quiet spaces. Driving upward to leaf with the ravens and crashing down to become the food of mushrooms. I have been tending this forest for thirty some years. 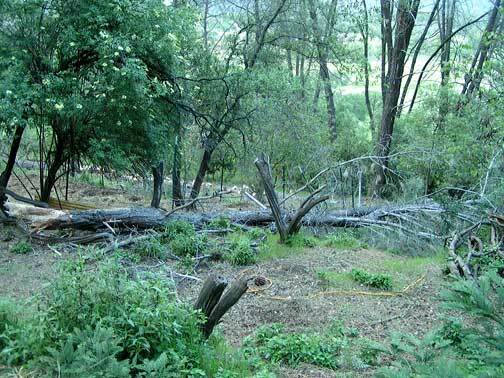 I have protected the saplings from the goats and cut away the deadfall and it is still a wild thing out of my control. Yet it has kept us warm through the winter and shaded us during the heat of summer. It has filled the air to breathe and whispered the familiar sound of home across the tree tops. Posted on April 28, 2013, in Caretaking the Forest, Psi Keep Center for the Arts and tagged brush clearing, care taking land, forest, psiKeep center for the arts. Bookmark the permalink. 3 Comments. Did I see an elderberry tree in bloom? Sweet !!! Yes. A huge one shading the goat pen.